Myles and I hosted wine club this month, which is always fun because that means I get to pick the theme! Our group is pretty serious- we have a CSW and several members that have been collecting wine since I was many years shy of legal drinking age. I decided this was a great opportunity to explore parts of France that aren’t considered “classic”, quick and dirty. I coined the theme “unglamorous” because we were decidedly NOT drinking wines that are highly sought after and outrageously expensive. All but one of the bottles were under $20. 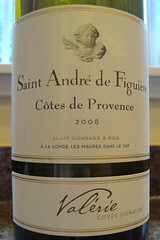 And, I also chose wines that were made from relatively unknown grapes, indigenous to these specific regions of France. I get to check off ten more grapes for Century Club! There are, in my mind, four unglamorous areas of France: Savoie, Jura, Provence and Southwest France. is in the Eastern part of the country, near the city of Lyon. It’s a mountainous region that produces far more white wine than red. is in the remote hills north of Savoie and grows a lot of the Burgundy grapes, pinot noir and chardonnay, and has always produced a lot of sparkling wine. Provence (which is otherwise known as glamourous, though not for its wines) is the southeastern corner of the country, situated on the Mediterranean Sea. It is most well known for rosé wines. Southwest France is reserved for the southwestern portion of the country near Spain. Here the Bordeaux grapes reign, and Cahors and Gaillac are some of the most well known, and historic, regions here. It was a light orange colored sparkling wine made from poulsard and gamay (which was the one red grape we’d all had before). It was pretty sweet and very fruity. A great appertif and one of the favorites of the evening. Poulsard is a relatively rare grape of the Jura region, it is dark and has adapted to its very particular climate and soils. Produces lightly colored wine with a distinguishing perfume. 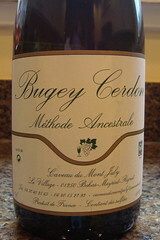 Gamay, most well known for being the sole grape in Beaujolais, it is the most planted red grape variety in the Savoie. A light and refreshing wine with good acid and a little citrus, though not as polished as I prefer wine in this style (think Alsatian Riesling). 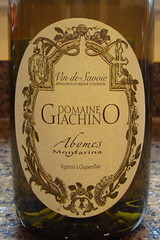 Made from Jacquere, a common white grape in the Savoie that produces lightly scented, essentially alpine dry wine. I thought this wine had very little nose, but was powerful in flavor and tasted of lanolin (from the semillon). 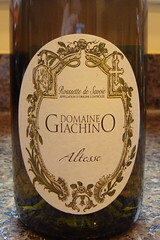 A blend of three grapes, rolle, an aromatic and crisp grape that is often blended with southern French varieties such as Viognier, Rousanne, Marsanne and Grenache Blanc; semillon, and ugni blanc, which is also known as Trebbiano in Italy. 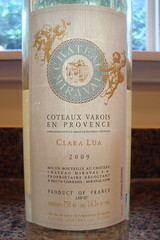 It is France’s most planted white grape variety. Extraordinary high yields and acidity, it is “undistinguished”. Or, one might say, unglamorous. This wine had a great nose, smelling of sweet peaches and honey. It tasted very much like a white rhone. Made from , Savoie’s finest white grape variety, once known at Roussette. Produces relatively exotically perfumed with with good acidity and is worth aging. My favorite wine of the evening. A little floral with minerality and a bit of sweetness on the nose. This wine also had bite. I probably liked it so much because I’ve found myself really enjoying the relatively new vintages of grenache blanc from California. It was a blend of grenache blanc and rolle. Rolle was the only grape that made its way into two of the wines for the evening. This wine smelled sweet in a plastic way. It was odd. 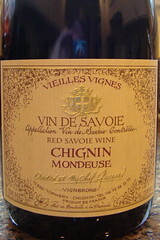 Made from mondeuse noire, which is one of the oldest and most distinctive red grapes of the Savoie. Wines are juicy and peppery with powerful flavors and colors and do not respond well to oak aging. This wine was a bit unfortunate. It smelled funky. We even noticed that after dumping what remained in our glasses a scent lingered. One of B.O. Yep, don’t want to drink any more of that! Made of negrette, a black grape variety that produces supple, perfumed and flirtatious wine best drunk young. Sometimes described as having a slightly animal (sweaty human?! ), or violet, flavor, unsuppressed by heavy oak aging. This wine was skunky on the nose. It had lots of acid with an herbal kick. I wrote in my notes “not very tasty”. Enough said. Made from , perhaps the oldest vine variety still used in the once-famous red wines of Gaillac. Produces deeply colored and lively wine with a full body. Vines that bud early give the wines good structure and acidity. We all thought this wine smelled like cabernet sauvignon and had the tannins of a young cab. Turns out we were onto something, it was 10% cab. 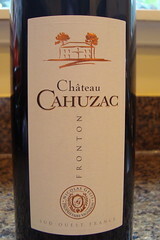 The other 90% was tannat, a distinctive, tough, deep black-berried vine variety. Inherent astringency leads to it often being blended with Cabernet Franc and some Cabernet Sauvignon and wood aging. Madiran is its noblest manifestation. This was the only red from the evening I would drink without complaint. So, there was have it. Four French regions, 10 news grape varieties. I promised the group I’d choose a less obscure theme next time I hosted! And a valuable lesson for me: Stick to the glamorous regions in France for red wine! Woohoo! My last Bordeaux! I’ve been saving the “best” for last. This wine, the 1994 Château Langoa Barton, is a third growth, thus the highest classed growth wine I bought for my Bordeaux “lesson”, the most expensive at $50, and the oldest. Exciting stuff. is a small commune on the left bank with the smallest production of the four well-known areas of the Médoc, three-quarters of which is produced by classified Château. It has the highest proportion of classified growths. The only thing dragging this area down is that it boasts not one first growth. Even so, it’s excellent land for wine grapes, it seems. Being an older wine, it was dark brick. On the nose it smelled of dried cherries, fig, cloves and anise. A very pleasant nose. It was still quite acidic and VERY earthy. I could taste the wood, but the earth and leather were prominent. There also was none of the bacon taste I’d gotten from other older Bordeaux. (Bacon only for unclassified wine?). It had a light body and went well with food. Unfortunately, I wasn’t bowled over. I still liked it, but I’m no Bordeaux convert. There’s certainly been a lot to learn about Bordeaux and undoubtedly there’s a lot of really great wine there (much of which I’ll probably never get to drink!). But, perhaps the biggest thing I’ve learned about Bordeaux is that while I appreciate its food-friendliness, low alcohol and the subtle nuances of each individual appellation, and I didn’t dislike any of the wines I tried, in the future I’m likely to choose a California Cabernet over Bordeaux. I’m not into fruit bombs or super high alcohol so there’s a lot of wine from California that I just don’t like. But, I'm going to continue to go out of my way to find those wines that are more of an old-world style. And you just can't beat being able to buy wine that's local, from the tasting room you visited at the winery. In the end, if I’m choosing a red wine to drink with my food I probably won’t choose cabernet (or merlot) at all. Bet you can't guess which French region I'll do next! In addition to enjoying the wines and varietal selection so much at Bonny Doon Vineyard, Myles has begun following the winemaker there, Randall Graham on Twitter. Thus far this has meant that Myles wants to try everything he recommends. Last weekend he bought a bottle of Chartreuse (a curious tasting liquor) and on Thursday he came home from work with a bottle of Freisa. Freisa is a native Italian grape, grown in the Piedmont region (ours was from Asti). 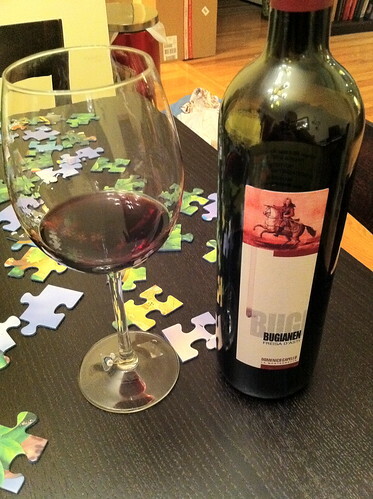 It's a particularly tannic grape with high acidity. Myles said that what attracted him to this wine was hearing that it's often made by harvesting 80% of the grapes and allowing that to ferment while the remaining 20% dries on the vine. Then, once the remaining grapes are dried out, they’re added to the rest and finish fermenting. Once I heard that Hugh Johnson (famous British winewriter) called wines made from Freisa “immensely appetizing” and Robert Parker, Jr. (famous American wine writer, who is often criticized for liking “fruit bombs”) calls them “totally repugnant”, I was definitely curious to try it. And considering Myles paid $7.99 for the bottle, I was really hoping it would be great. The wine was very acidic and bitter, but was a good food wine. Not too shabby! I don’t actually have too much to say about , save for a few distinguishing facts. First is that unlike most of the other Bordeaux appellations, the château here are not spread out evenly throughout the countryside, but rather clustered around the villages. Second, is that Margaux has some of the thinnest soil in all of the Médoc, which means that the roots of the grapevines have been known to go down as deep as 23 feet into the ground to access water! Returning, as we always must, to the 1855 classification, Margaux has just one first growth- creatively named Château Margaux. But, it has more second and third growths than anywhere else in the Médoc. Logic would say, then, that the largest concentration of fine Bordeaux can be found here. 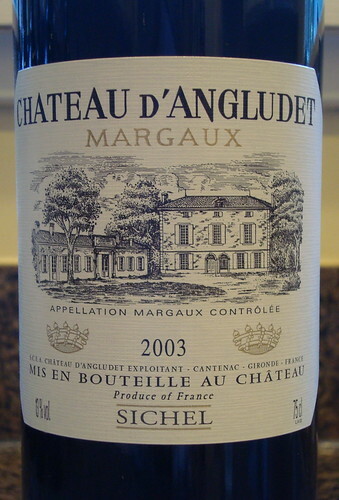 The wine I sampled, the 2003 Château d'Angludet, though not even classified (it's a Cru Bourgeois, and the Wine Atlas does say that this château makes wine of “classed-growth quality”), did not disappoint. It was by far my most favorite left bank wine of the bunch. It was very dark, with rosy pink edges. The nose was super fragrant, smelling of cherries, raspberries, blackberries, a bit of oak and spice. 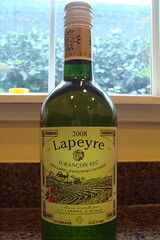 While more full than most of the Bordeaux have been, I still thought it was more of a medium-bodied wine. 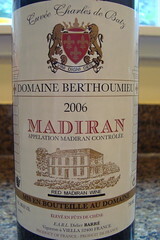 It was earthy with smooth tannins and a white wine like minerality on the finish. It didn’t have the aged taste (i.e. bacon) I’ve gotten from a lot of older wines lately, maybe it wasn’t old enough yet. It certainly could’ve continued to age. It did taste of pepper and leather. Super pleasant!